Just a warning -- this is a sad book that may make you feel like crying. I read this one as an e-book from my local library. 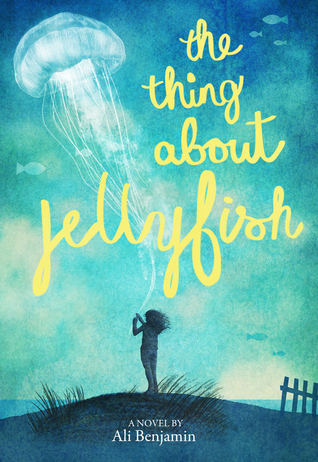 The Thing About Jellyfish was written by Ali Benjamin and published by Little, Brown and Company in 2015. If you like stories that make you feel a lot of emotion, this is a good choice. I found it quite sad. The difficulties of friendships and fitting in during middle school are portrayed realistically. Suzy had an interesting character. One of the things I liked most about this novel was the integration of scientific facts and information about jellyfish. As a writer, I also admired the way the author used language to show the pain that Suzy was feeling. It’s a good example of a story where a character undergoes an emotional transformation. As a child, Ali Benjamin spent many hours catching bugs and frogs. Her love of nature is what inspired The Thing About Jellyfish. 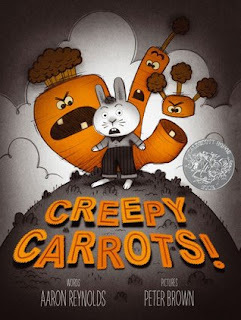 Learning from Picture Books -- CREEPY CARROTS! Here’s a story that’s a little bit spooky – in a fun way! Jasper Rabbit loves carrots—especially Crackenhopper Field carrots. He eats them on the way to school. Until the day the carrots start following him...or are they? Creepy Carrots was written by Aaron Reynolds and illustrated by Peter Brown. It was published by Simon & Schuster Books for Young Readers in 2012. The shades of gray in the illustrations really helped to create a spooky atmosphere for the story. I really admired the way light and shadow was used. The facial expressions on the carrots fit so well with the text. This book would be a good one for introducing a discussion about fears and fearful feelings. The interesting illustration style, with shades of charcoal and a few bits of orange, would be interesting to talk about with students. Illustrator Peter Brown talks about how he created the art work. Make a list of “scary things”. Talk about what to do when you feel scared. Talk about carrots and how they grow. Could your class grow their own carrots? Draw a picture or write about your favorite page in the story. Create some art using shades of grey or pencil drawing. Choose one colour to add to make something in your picture stand out. This is another story where a character is dealing with a problem – I seem to be finding a lot of them lately! I’d heard about this one from many other bloggers and was looking forward to reading it, because I loved the author's previous book, The One and Only Ivan. I borrowed the hardcover from my local library. 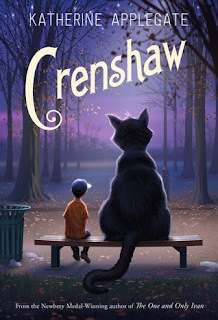 Crenshaw was written by Katherine Applegate and published by Feiwel and Friends in 2015. This is such a unique story. I’ve never read a middle grade where an imaginary friend plays such a big role in the story, and I was surprised by how much I liked it. What was especially well done, I thought, was the way the author portrayed Jackson’s feelings about becoming homeless, and also the way it happened. It was a good depiction of a family’s struggle. I enjoyed Katherine Applegate’s writing style in The One and Only Ivan and I also enjoyed it here. The novel is well-paced, has spare writing with the occasional very meaningful sentence or image that makes you think. Katherine Applegate also wrote The One and Only Ivan, which won the 2013 Newbery Medal. She lives in California with her husband and two children. Inspired by Crenshaw, in October, Macmillan Children’s Publishing is partnering with bookstores to host a nationwide food drive. There’s a great trailer for this book! I’ve heard about this one from many other bloggers and was excited when it finally became available at my local library. I read it as an e-book, but this is one where I might just buy my own copy. A very cool thing about this book is that the author is posting Q & A videos about the book to celebrate Global Read Aloud 2015. 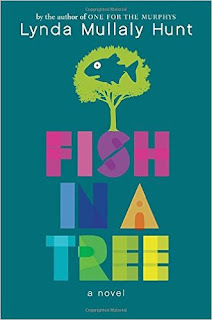 Fish in a Tree was written by Lynda Mullaly Hunt and published by Nancy Paulsen Books of the Penguin Group in 2015. I connected with Ally’s character as she struggled to cope with teasing and bullying when other students noticed her struggle with reading. I liked the spark in her personality. Since she is a talented artist, I wondered what her drawings would’ve looked like. Her friends Keisha and Albert were caring and supportive and added some humor to the story. It was great to see a teacher portrayed as caring and willing to help Ally. As a writer, I admired the language and interesting images the author chose to bring out key moments. Much of this story is told through dialogue, so it’s a good one to read to see how to use dialogue effectively. Lynda Mullaly Hunt drew on her own experiences as a child with reading difficulties when writing FISH IN A TREE. She also wrote the middle grade novel, ONE FOR THE MURPHYS. During October, she is celebrating Global Read Aloud 2015 with giveaways and special videos answering questions about the book. You also can hear her reading the first chapter. For more middle grade book recommendations, check out the links at Marvelous Middle Grade Monday! Learning from Picture Books - WHERE ARE MY BOOKS? I’m so excited to share with you a cute read aloud that celebrates a love of books and libraries! 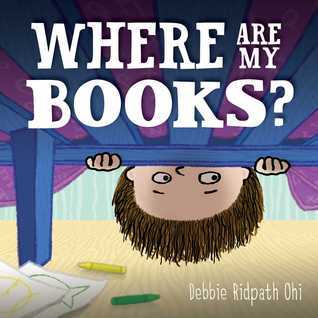 The characters in this story are very enthusiastic about books, just like the illustrator-author (my writing friend) Debbie Ridpath Ohi. Spencer loves to read. He reads a book every night. But one morning his favorite book goes missing, and in its place is a tulip. Spencer searches high and low, but he can’t find his book. The next morning another book is missing, a nut in its place. And the morning after that, another book is missing. What is happening to Spencer’s books? When he finds out, Spencer devises a surprising solution that will delight readers (and librarians) everywhere. Where Are My Books? was written and illustrated by Debbie Ridpath Ohi and published by Simon & Schuster Books for Young Readers in 2015. The concept is relatable: Most children have experienced the loss of a beloved object, and maybe even a cherished book. I like the very direct and simple opening line: “Spencer loved books” because it offers so much possibility. It immediately makes me think about books I have loved and I can connect with Spencer, a fellow book lover. This is a good book to study to think about how character is created using a combination of words and illustration. Spencer’s personality comes through in the words the author has selected to convey his ideas (and distress) about his books. The expressive faces and gestures work well to show his thoughts and feelings. This is fun book to read to introduce a discussion about favourite books and places to read them. The character expressions provide lots of opportunities for talking about feelings. The large size and bold colors of the illustrations make them wonderful for read alouds, since even children in the back of a group can see them. With clues in the illustrations, students can predict or try to guess what happened to Spencer’s books. A comprehensive teacher guide with lots of activities in different curricular areas is available on the author’s website. It would also be interesting to talk with students about how the book was created, and especially how she makes her illustrations. Create a shared list of favorite books. Build a library in your classroom. How would you organize it? Draw a plan. Think about how your plan might change if you were creating a library for squirrels. Or for another animal of your choice. What clues are there in the text to solve the mystery of Spencer’s missing books? Why did the author choose those clues? Draw a picture or write a story with clues for a missing object. Create a guessing game about your favorite book. Using a folded paper or “book cover”, write or draw clues for the book on the outside. Then, inside, draw a picture of the book and explain why you enjoyed reading it.